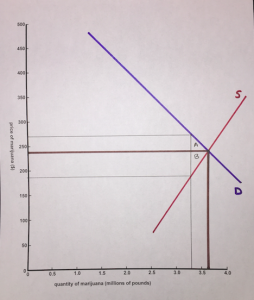 With the upcoming election, examples of economics in action abound. 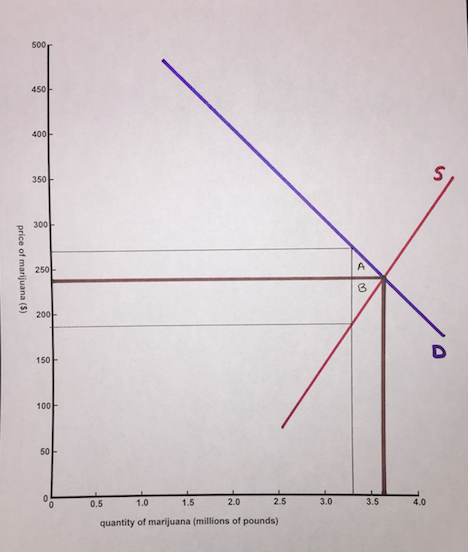 To illustrate one, I will examine Massachusetts Question 4, a proposition to end marijuana prohibition1, which provides an opportunity to use ideas from the third week of class about markets, trade, and taxes. To start, we might think of a farmer who typically grows tomatoes. If he decides to take part in providing newly legal marijuana to market, he must grow fewer tomatoes. A PPF curve could have the typical bowed out curve because he already has some infrastructure and expertise that’s good for tomatoes and less good for marijuana. Now, let’s imagine that the proposition passes and marijuana is legalized. 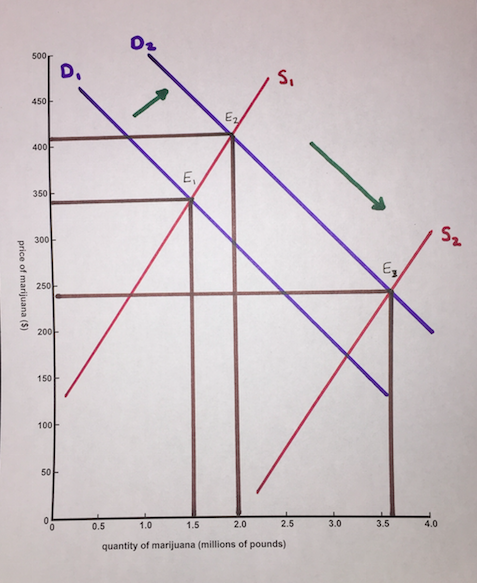 The demand curve will shift up from D1 to D2 as more people want to legally buy marijuana. We then would expect the price to rise to $410 with suppliers willing to sell 2 million ounces, as seen at E2. But growers will likely quickly adjust to this new income opportunity and supply will increase. In Oregon for instance, the price of an ounce is $204. 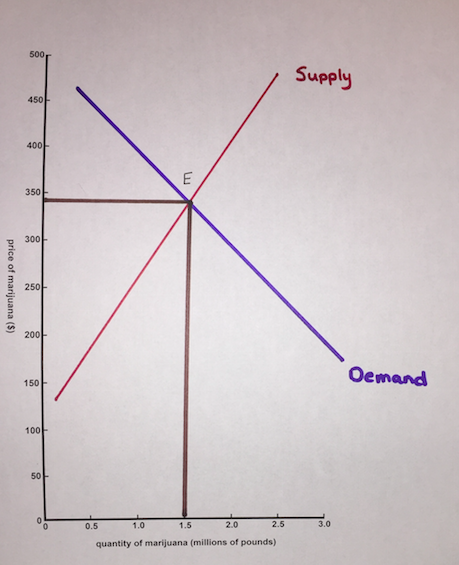 If growers anywhere in the U.S. can send their products to Massachusetts, the equilibrium might drop to this price, and consumption in Massachusetts would increase as seen at E3. Not surprisingly, the government would be delighted to collect tax on this new source of revenue as they already do for alcohol and cigarettes, and so might increase the price by 30%, as was done in Colorado. 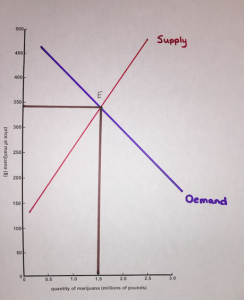 The effect of tax is to reduce both production and consumption, with a higher price and a lower quantity than before the addition of the tax. 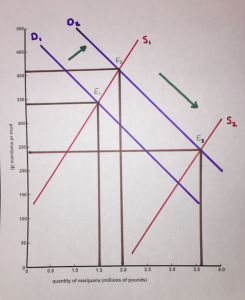 This new price of $265 of which $61 is tax is reflected in area A, which consists of the deadweight that is consumer surplus loss and area B, which consists of the deadweight that is producer surplus loss. One imagines that the deadweight loss will be quite large at a taxation rate of 30% on a good with presumably elastic demand. But profitable nonetheless for the state coffers! By the time we get to vote on November 8th, our class will have covered many additional economic tools to take this further. For example, my diagrams so far have just one market. How would having a legal market in Massachusetts be affected by smuggling of marijuana from elsewhere? Also, my diagram doesn’t yet have any externalities from marijuana use. We know that alcohol and opioid use cause a lot of collateral damage. Does marijuana use cause similar harm to users’ children, neighbors, employers or other bystanders? Any quick google search provides interesting reading on the topic of the economics of cannabis legalization6,7,8 all which can be seen through an economic lens.